Email marketing is your business’s most influential voice. This blog is about acknowledging your best opportunities to solidify your brand and to build up a dedicated customer base. 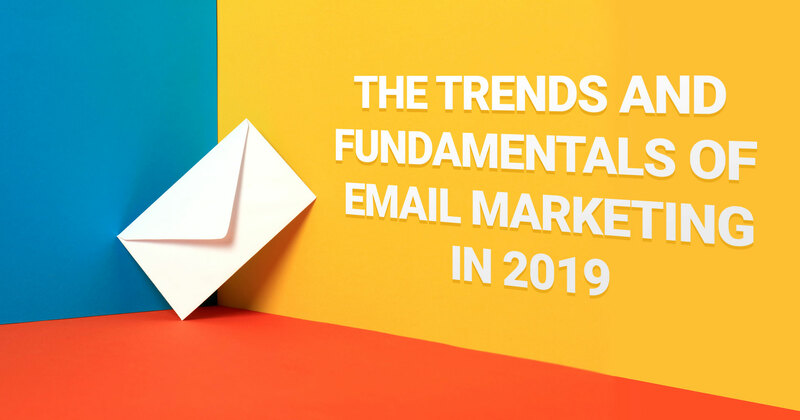 We’ll cover the fundamentals of email marketing, the trends leading up to 2019, and how e-commerce sellers can best adapt. In case you missed it over the last decade, or are new to e-commerce, the strongest form of promotion for your products is email marketing. Salesforce, the masters of data collection, state that every $1 invested in email marketing will return an average of $38. Investing time and money in improving your company’s email communication is obviously worthwhile, but where do you begin? If you don’t already have the email marketing fundamentals in place, a great place to start would be to find yourself a “free” Email Service Provider (ESP) such as Constant Contact or MailChimp. These ESP services keep your messaging looking tidy and professional, and can even help you adhere to some best practices for improved open rates and conversions. Later, we’ll dive into how sellers on marketplaces can create email campaigns, but first, we will cover what sellers can do on their end to communicate directly with their customers and grow the relationship. Before we get into the power of personalized email content, it is important to cover the importance of customer database segmentation. Segmentation is all about slicing the pie of customer data to create specific groups of customers that you want to create a campaign for. Examples of which include targeting customers who purchased in Q1 2018, but haven’t purchased in Q1 2019; or touching base on customers who bought version 4.0 and informing them of the new 5.0 upgrades. If you don’t have the resources to analyze this granular data across so many data points, it may be beneficial to research small business Customer Relationship Management (CRM) software such as Hubspot, Salesforce Essentials, and FreshSales. This software is designed to help maintain the database of everything that’s important for your business and can significantly improve your productivity, marketing budgets, and labor costs. If you needed even more evidence of a CRM’s importance, take a look at IBM’s reporting that a CRM’s ROI can exceed a whopping 245%. As a business, you want to have engaged email recipients. Following the tips mentioned above, you have worked hard to establish and speak to your specific audience; so why would you waste these precision marketing tools and “shotgun” your emails to thousands of passive or uninterested recipients? Customers and leads who aren’t interested in your messaging or products are not worth purchasing or holding onto. The modern way to build an email marketing recipient list is through time and quality messaging. Buying hundreds or thousands of leads and praying that something, anything sticks is a bygone tactic – and besides, you are better than this! Keeping this goal in mind, it is in everyone’s best interest to take the Marie Kondo approach and cleanse your contact lists of anyone who doesn’t bring your business joy. By providing efficient and simple ways for recipients to manage their email preferences, you can make sure that you are always speaking to an engaged audience and can build better metrics and analytics for future campaigns. So, when allowing customers to unsubscribe or edit their email preferences, it’s best to create a quick and simple process to get them where they want to go. Some best practices for efficient unsubscribes are to avoid multiple login screens, cookie consent blocks, and “are you sure?” popups. Okay, now that all your tools are in place, and your audience is established, let’s go over what email marketing messaging works best for e-commerce sellers. Personalized email content has been the trend for several years now. However, if you think the “Hi #profile_name#” approach to email personalization is going to cut it, prepare for a lot of spam reporting. Impactful personalized emails today take dedicated and thoughtful messaging around the specific interests of the recipient. Personalized content should be about providing solutions to your customer’s known and unknown needs. Did they purchase a camera from you – but not a bag or additional batteries? Consider creating custom codes to use for item-specific promotions. With a good CRM and ESP in place, your email marketing campaigns are only limited to your imagination – but how can you best maintain interest in between promotions? The messaging you send your customers shouldn’t be a constant barrage of limited time deals and blowout sales. This information quickly grows stale and you’ll soon see your unsubscribes ticking up. However, you also don’t want to lose their attention as it’s important to keep your brand and/or products top of mind. Because of this, consider tailoring your messaging around the data that you already have such as their purchase history and site interactions. With data like this, you can create nurturing content such as tips and tricks on how to get the most out of their product, or lifestyle content that appeals to other known interests. Staying relevant and addressing unknown needs will have your recipients turn to you for future purchases and elevate your brand authority within your market space. Sellers need to send honest messaging. It’s getting easier and easier to report spam, and if you alienate your recipients with subject lines like: “Claim Your $500 Reward”, “Hi”, or “re: Your Order”, you may never see another sale from them again. Another rising trend for subject lines is to include emojis. Many companies have reported the benefits of including these cartoon characters within their subject lines. Speaking personally, I have a philosophy to never open an email with an emoji in the subject line – so maybe consider doing an A/B test on your send list before going all in on 藍. If you are looking for a simple tick up in your open rates, keep it short. Subject lines that are 4-5 words in length perform best. Also, something that is often overlooked is the impact that readability has for emails (shocking). Yes, the easier to read a subject line is, the more likely it is to be opened. That is why you should follow the best practice of using Title Case in your subject line – meaning the first letter of every word is capitalized. Of course, all recipient bases are different and if your business is selling extinguishers, maybe none of these strategies will work for you. Expect for factors like open rates, click-throughs, and other engagement elements to be weighted in a significant way by algorithms / artificial intelligence (AI). If emails from senders keep piling up without being opened, the AI will automatically present the option to unsubscribe from the email list. This mechanism makes for a better experience for recipients and ensures that senders are speaking to an engaged audience. The concept of brand indicators on email sends is gaining speed. Think of these working like the “verified” mark on Twitter. Mailbox providers like Microsoft will be lending authenticity to branded email marketing sends by including a company logo adjacent to their message. Look for early adoptions by the largest companies as a form of beta test before access inevitably trickles down to small and medium-sized businesses. Many multinational organizations are already complying with the General Data Protection Regulation (GDPR) created by the European Union. The data privacy regulation is dedicated to giving EU citizens control over their privacy and personal data – even if they travel to other countries. This puts a lot of onus on global sites to comply with the GDPR in the chance that EU citizens interact with their site. Why this is so important for non-cross-border sellers is because of the new California Consumer Privacy Act (CCPA) of 2018. Beginning January 1, 2020, The CCPA establishes that California residents have the right to request that businesses disclose the data that is gathered (and often sold) about them. This is a lengthy topic that we will cover in-depth in a later post, but know that if your company sells data, your business must establish a way to monitor and report which data was sold in an effort to comply with these requests. How Can Newegg Help My Email Campaigns? Everything that we have discussed relates to sellers creating and maintaining their own customer database – but this customer data is not available on marketplaces or third-party sale sites. So how can sellers create email marketing campaigns and reach their customers on Newegg Marketplace? Newegg has created Post Purchase Emails that give sellers the ability to create personal email messaging that drives existing customers back to their on-site seller store. This service helps to further strengthen customer loyalty and branding. The Post Purchase Email service utilizes much of the same criteria as a CRM, so you can be sure that your message is reaching the perfect audience. There are constant news and updates in the world of email marketing. Have you heard about the newest vocabulary usage that garners .008% more conversions? How about the new scientifically proven ideal send time for maximum open rates? Don’t worry about the minutia, just make sure to stay on top of your best practices and keep checking back on this blog as we update it with everything you need to know for sensible and effective email marketing. How Will Increasing Fulfillment Fees Impact Your Business This Year?